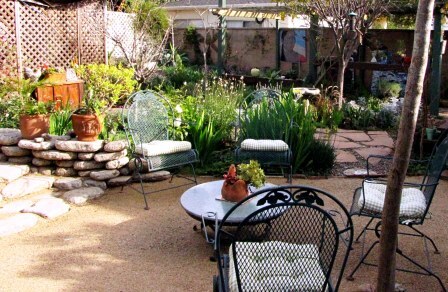 After remodeling their small Mar Vista Home six years ago, these garden enthusiasts decided to dig up the front lawn, which had died due to lack of water. They bought a few drought tolerant plants and planted them helter-skelter in the front yard in the hopes that they would take. Since that time the garden has become a "breath of fresh air". Bees, butterflies and birds visit year round and help pollinate their “favorite place on Earth”. In 2011, after ceremoniously digging out the last little patch of grass, the homeowners installed a small patch of decomposed granite. After considering an irrigation system, they eventually decided that the joys of hand watering and the pleasure of spending quality time with their plants made irrigation irrelevant. They started raising chickens two years ago, receiving the benefits of both eggs and compost material that was spread liberally in the garden. Their pond recycles the water used and creates a lovely habitat for other creatures. They have a small and large compost area. They are having great fun with the succulents, clipping cuttings and enjoying their growth all year long. They have an abundance of peaches, plums and grapes in the summer. The homeowners lovingly attend to their plants on a daily basis. Gardening has become not just a hobby, but a meditation and a lifestyle for this couple. Their grown children often comment on the ever-changing landscape that results from this constant attentiveness. These committed, inspired gardeners hope that someday lawnmowers and leaf blowers will become obsolete, and the air will be filled with the “sound of peacefully growing plants”.